Our skincare is award winning! Find out more here.. 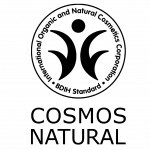 The COSMOS-standard label is a Europe-wide standard that was developed by BDIH, the German non-profit association, together with Cosmebio (France), Ecocert (France), ICEA (Italy) and Social Association (UK). The certification can be approved by any of these organizations. In order to achieve the COSMOS certification, every aspect of the company’s production process is put under scrutiny during an audit that can last several days. The audit includes: inspection of the manufacturing facility, a full audit of ingredients including their origin and how they were processed, the company demonstrating that its production methods are ecologically sound, product formulas, labels and packaging are approved, any non-organic ingredients have been used because no organic equivalents are available, all ingredients are GM-free. To receive the COSMOS Organic label, at least 95% of the agro-ingredients must be organic. Products that pass the audit but do not contain at least 95% agro-organic ingredients are eligible for the COSMOS Natural certification. COSMOS Natural products may of course contain some organic ingredients (as ours do), but at a lower percentage than those with the Organic certification. For these products, the percentage of natural origin ingredients must be indicated on the label – except where the products are 100% natural origin.